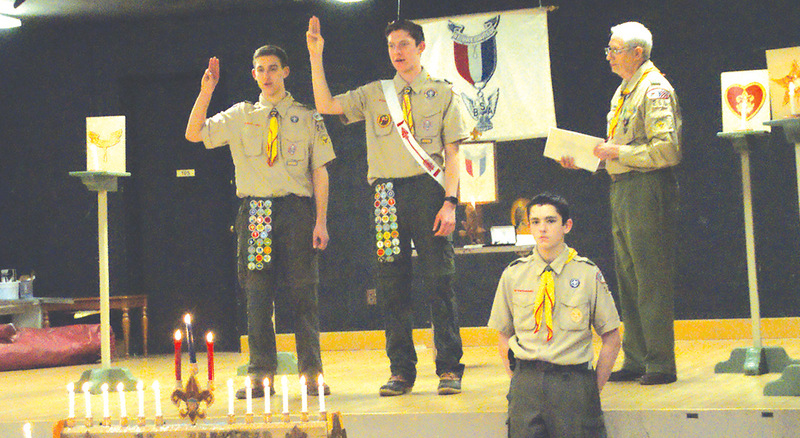 Stephen Sattan, left, and his brother Michael recite the Scout Oath during Assistant Scoutmaster Art Sikes’s administration of the Eagle Scout Pledge. Second Class Scout Bryce Klaus stands at the right, ready to assist at the stage stairs. This was not the first time that Boy Scout Troop 260 has had several Eagle Scouts in the same family, but the Court of Honor on February 26 was the first time the brothers were awarded in the same ceremony. Michael Sattan and Stephen Sattan both received their coveted awards that evening, with a packed Fellowship Hall at Second Baptist to applaud. Following the Scouts’ impressive candle-lighting ceremony, all the Eagle Scouts present, young and old, lined up at the side of the audience, and Assistant Scoutmaster Art Sikes administered the Eagle Charge. Scoutmaster Mike Cremmins presented the awards, and special recognitions were given by State Representative Tami Zawistowski and First Selectmen Melissa Mack. Senior Patrol Leader Wyatt Cashman served as master of ceremonies. Stephen’s project arose from his participation in stage productions at Suffield Middle School. Realizing that the old stage floor was plagued with staples and surface damage from many productions, he worked with school staff to get permission and plan an appropriate time for a face lift, when he led a crew of volunteers who cleaned, scraped, sanded, and repainted the big space.